Take control of your intrusion and access management witht the DMP Entre' Access and Security Management System. With DMP Entré, XR500 Series Command Processor™ Panel users can manage both intrusion and access control in one easy-to-use software application. System managers can now have fast, simple point-and-click control over every aspect of their security system. • Web or Standard user clients or both available. Entré Lite™: 16 doors included, up to four XR500 Series panels, personnel management, full reports, and event management. Entré Business™: The same features as Entré Lite. Expandable to 96 doors maximum and up to 24 XR500 Series panels. Entré Enterprise™: The same features as Entré Business with 96 doors included. Expandable to unlimited number of doors, users and XR500 Series panels. • Simple user management, with the ability to import users from existing databases. • Assign user access by group, facility or other parameters. • Drop down lists for devices, user data and other information facilitate fast and accurate searches. 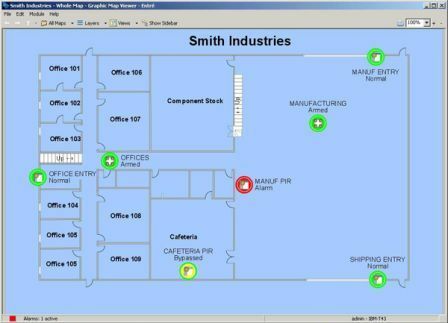 • View system status in one of a variety of views for simplified alarm monitoring management. • Customizable reports for added flexibility. • Point-and-click control of alarms and devices. • Modular design enables customization, with optional modules for added features. • Available in French, Spanish, or English, with dual- language operation mode. • Full reporting, including at-a-glance dashboard graphics and charts or traditional tabular displays, with the ability to produce reports in a variety of file types. 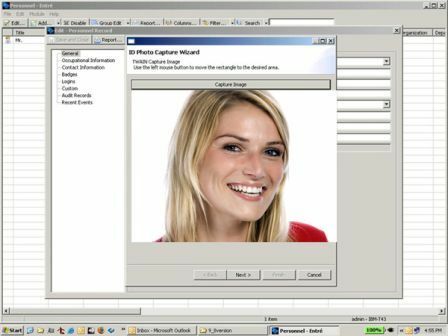 • Image management of users and event photos.